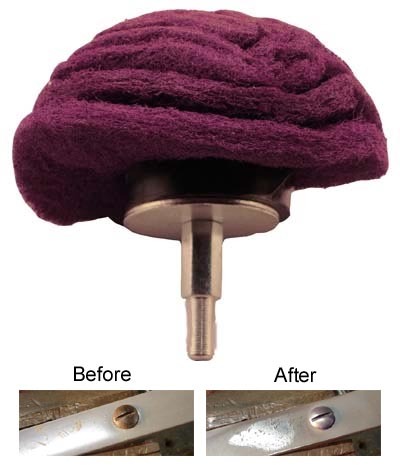 Our new mushroom shaped scuff pads are great for paint, rust, and oxidation removal, especially in hard to reach areas. The scuff pad is made of nylon web material very similar to Scotch-Brite material which is commonly used to remove rust and light paint. This mushroom-shaped pad design works faster than conventional scuff pads because it can be mounted on a standard drill and spun at speeds up to 1,500 rpm. These scuff pads are perfect for manifold restoration. See the before and after pictures, it removed the rust from the screw and even removed some of the powder coated paint with no sandpaper in only a couple of minutes.